I know that this might seem like it’s coming out of left field. Jello Jigglers? Who is this woman and where is the one bringing us easy dinner ideas and chocolate? She is still here, friends. But she also has 3 kids 6 and under, and she acknowledges that Easter is coming. And since she misses pretty much every opportunity to make cute holiday-themed food, she figured she shouldn’t let this slip by. 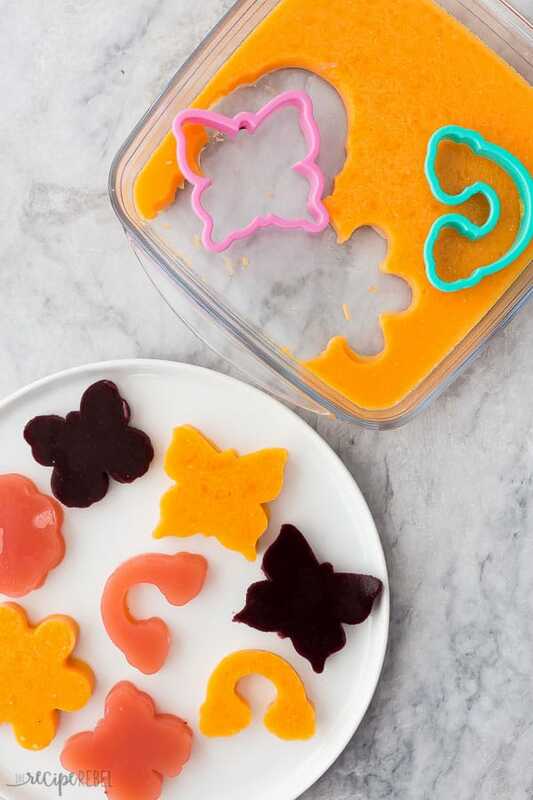 Besides — homemade Jello Jigglers are fun to make! (and are way better for you than that store bought mystery-ingredient junk). I’m not going to say that I don’t have a stash of Jello in my cupboard. I do. And I make my kids Jello for their birthdays, and really only then because we generally eat real food around here. This includes sugar and chocolate, but doesn’t usually include a lot of artificial flavoring or colors. So I wanted to make something cute, but I also wanted to make something that we felt good about eating. Besides, the fruit juice aisle is really the place to be. You’re no longer limited to that nasty fake lemon stuff if you want some yellow jigglers — look around and dream up some fun combinations! Try pomegranate! Try cranberry! Try anything and everything you want to because they are so darn fun to make. You need half of your juice cold — you’ll use this to bloom the gelatin which ensures that it dissolves nicely and has a smooth texture. You’ll heat the rest of the juice while your gelatin blooms, and then you’ll pour it over top of the gelatin. Whisk until smooth, place in a shallow container, and refrigerate until set. Make red and green jigglers in Christmas shapes. Make pink and yellow and green in Easter and Spring shapes. Make your kids favorite shapes in their favorite flavors on their birthdays. How long do Jello Jigglers last? You can store Jello Jigglers in the refrigerator for 1-2 weeks, if they last that long! They cannot be stored at room temperature or frozen. What flavors of juice work best? I like to get creative and see what flavor combinations and colors we can come up with! How do you make creamy Jello Jigglers? You could add either vanilla pudding or yogurt, but I prefer to add yogurt as it’s a healthier option (and that is why we’re making these!). Feel free to add different flavors of yogurt to mix things up. Follow the method below, but put only 1/2 cup of cold juice into the bowl to bloom the gelatin. Heat the remaining 1 cup juice until it starts to simmer, pour over the gelatin as instructed. Whisk. When gelatin is dissolved, whisk in yogurt, and pour into pan. 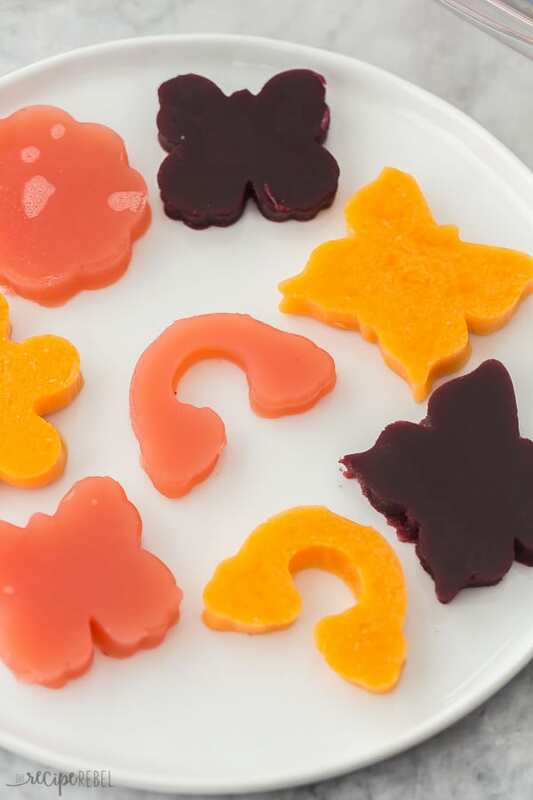 How do you add fruit puree to Jello Jigglers? You can swap out quite a bit of the liquid for fruit puree, but I like to stick to a 1:1 ratio of juice and puree. In the pot, heat 1/2 cup juice and 1 cup fruit puree (if you want to sweeten it because the fruit is bitter, you can add a bit of sugar here). Pour over the gelatin and whisk as instructed. Pour into pan and refrigerate. 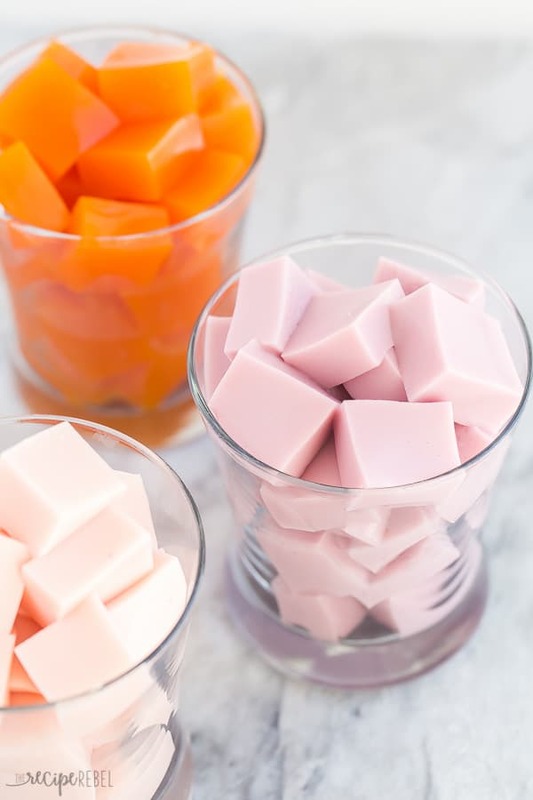 These Jello Jigglers are made with real fruit juice and gelatin, no artificial flavors or colors! They're perfect for any holiday as you can make them in any color or shape. Place 1 cup of fruit juice in a medium sized bowl. Sprinkle both packages of gelatin evenly over the top and set aside. Place remaining 1 cup juice in a small pot and heat over medium heat until bubbles begin forming at the edges (3-5 minutes). Pour over the gelatin in the bowl and whisk for 1-2 minutes to combine. Pour into a lightly greased 8x8" pan and refrigerate 3-4 hours or overnight until set. Once set, I recommend covering with plastic wrap or placing in a container to store. Cut into squares or shapes and serve. *You can add a bit of sugar if you prefer your jigglers sweeter, just do a quick taste of the gelatin mixture (be sure to cool it on the spoon first! ), and then whisk some into the hot liquid and let dissolve before pouring into the pan. **You can also add yogurt or fruit puree. See post above for exact directions. I am so making these on the weekend! My husband and kids love jello and I hate the stuff (all because of the mysterious ingredients and artificial stuff!) I pretend I don’t see them putting it in the cart or eating it! So glad you shared this, Ashley! 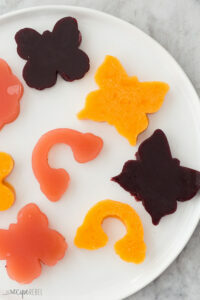 My kids love Jello too, which is why I experimented so much with a homemade version! Let me know how it goes!